Egret anchored on the west side of the island. The vertical cliffs in the background extend in a shallow sweep around the bathing beach accessed by a tunnel carved thru the rock by the Romans. The ramshackle restaurant and entrance tunnel would be to the right of the photograph. 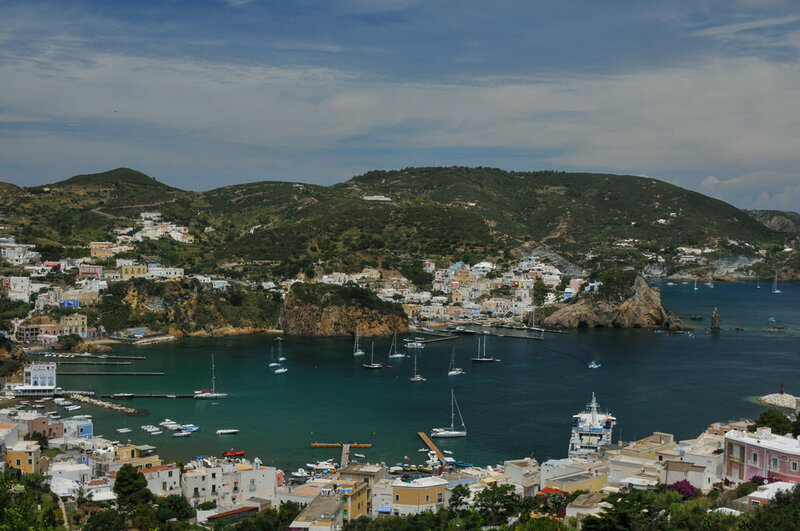 The island of Ponza (isola di Ponza) is located in the Mediterranean Sea 60nm south of Rome and offshore opposite the city of Napoli (Naples). The narrow island stretches approximately 8 miles from its most narrow portion to the northeast south to the larger, more populated area of the southwest. 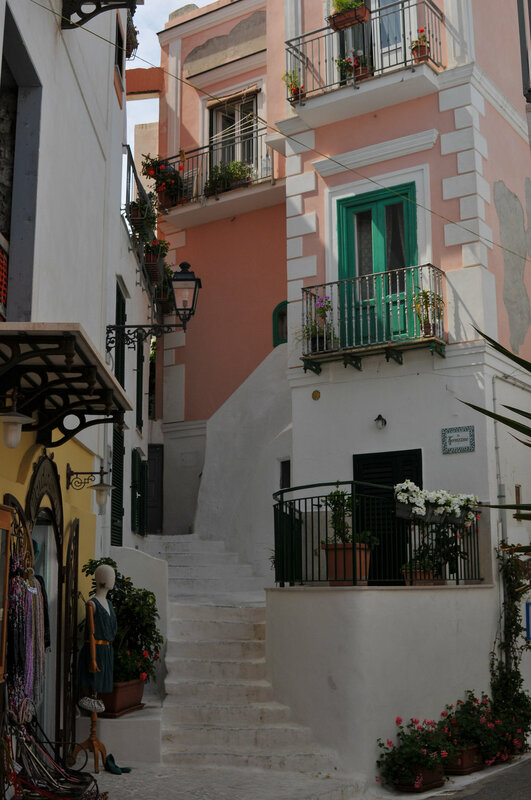 Typical downtown Ponza street scene. Mary and I walked thru most of the town’s narrow alleyways to the top of the hill then back down thru a different route. Burros still carry heavy loads, such as construction materials, up the stairs just like when the town was built years ago. Mary and I visited Ponza three times over the years, the last on Egret’s return to the Mediterranean after her circumnavigation. The last trip was the most relaxed because we had paid a deposit to winter in Gaeta, about 120km south of Rome, so were simply pleasuring ourselves cruising from July until late September when she would arrive at her winter berth. 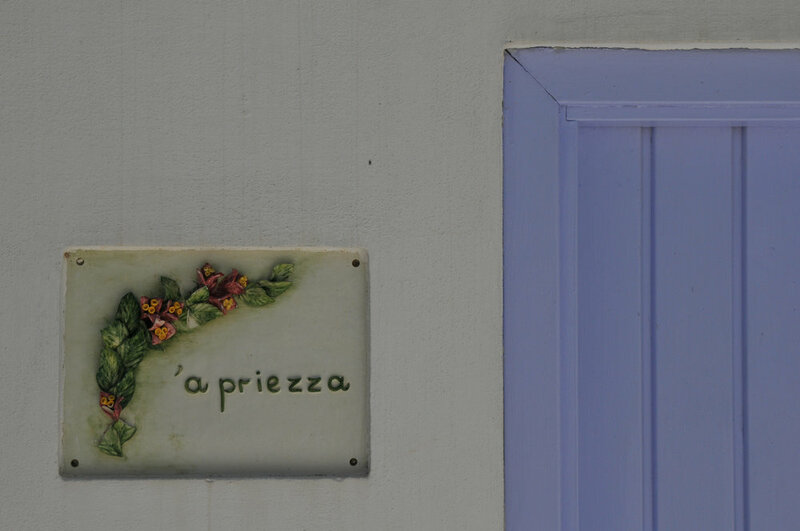 I don’t remember what this particular ceramic was all about but signs like this were scattered all thru Ponza’s streets. There is no marina space in Ponza for larger boats so even the Big Dogs have to anchor out. Most boats anchor in an area called the Inferno, named for its vertical white flame-like rock among darker red rock. The anchorage all summer long is calm so it is as good as Mediterranean anchoring can be. In the case of a rare summertime wind shift, the backside of the island has good holding in white sand. Smaller boats anchor in 20 feet near shore on out to the larger boats in 60 feet of water. We tended to anchor deeper because the captains who know how to anchor usually run the larger boats, not the atypical Med small boat weekender who drops the pick and chain in a single heap then dives overboard for a swim. 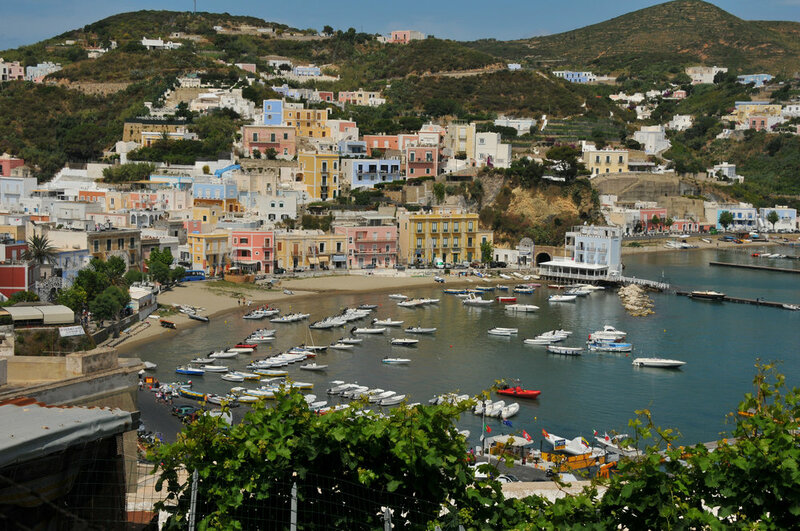 The small boat harbor at Ponza borders the larger fishing boat and commercial harbor. These boats are mostly rental boats. Egret’s dink is pulled up on the beach in front of the bright coral house left center. Mary and I would dinghy in every day and walk the town, carrying cameras and snacks in a backpack. Over many trips ashore during different visits we got to know the town pretty well. We had our favorite coffee shop overlooking the harbor, and restaurants high up the hill also overlooking the harbor and scenic winding routes thru town. Like most memories, our favorite Ponza memories just kind of happened. Modern construction in Ponza with an eye on traditional Greek construction and whitewash. The accents give away that it is a relatively new structure. In addition to walking around town and a few bus trips to the far end of the island, we also did a lot of dinghy exploring. Once you leave the Inferno anchorage and the main harbor area, there are very few boats or people. That’s what we like best, exploring in peace. Even though we carried a 12-foot fiberglass catamaran dinghy with a 30hp Yamadog two stroke, we always used the second dinghy, a 9-foot aluminum bottom rib with a 3hp Yamadog two stroke. It was simply easier to find a place to dock, less chance of sticky fingers, and if there was a surge or wakes, a rubber boat can take the impact whereas a hard dink will suffer. 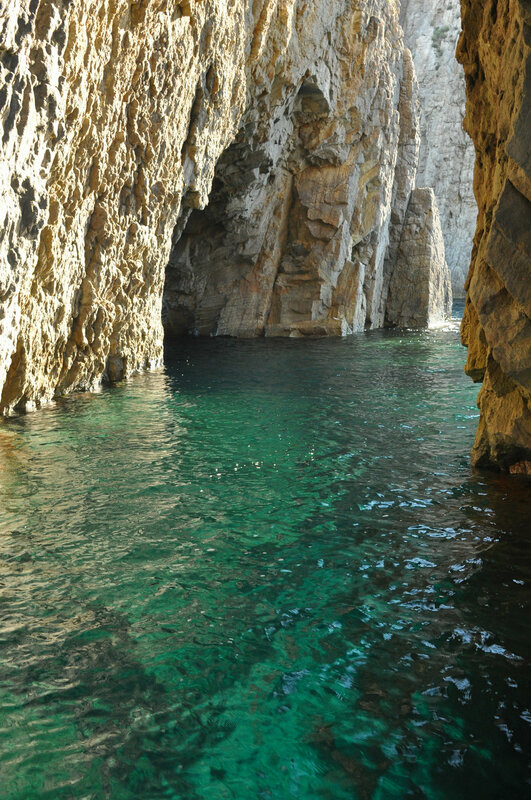 Roman baths around the corner from Ponza’s harbor were carved from solid rock. Tunnels lead to the far side of the island from the back of the two entrances on the left. The baths themselves were small rectangular pools with underwater seating flooded by the sea with surge protection breakwaters at the entrance. Just past the harbor entrance to the south are Roman baths carved from solid rock. Mary and I learned after the first trip we needed flashlights to find our way thru the maze of tunnels to the far side of the island. That was always fun and we only did it during the early morning calm or whenever there was no surge. We had to anchor close enough to step ashore and not have the dinghy pound on the rocks. Dinghy exploring a larger cave. In this case the cave had a large chimney to let in light. Images like this were difficult with cameras of the day trying to deal with low light and no flash. With the cameras we have today it is easy. At the extreme south of the island, a short distance around the corner from the Baths are a series of offshore rock spires with passages in-between for small boats. Along the island side rock cliffs are windows for rooms carved from solid rock centuries before. Mary took this early morning shot of Ponza’s harbor from Egret’s anchorage in the Inferno. Rock pinnacles like in the photograph are scattered around the island. One day we decided to take the little dink to the far side of the island to see what we could see. Chugging past the Baths, around the bottom of the island, through the pinnacles into the wild, wild unknown, we came across a semi-circular beach backed by sheer cliffs and no visible entrance. At the south end of the beach appeared to be a wild and crazy restaurant built from driftwood, pallets and cast-offs. We beached the dink and walked over to see what was whipping. What we saw from offshore is exactly what it appeared to be. Some local dude had walled off a cave, put in a few plastic tables and chairs and hung up his shingle. He had a propane cooker and a fridge. That’s it. Electricity to run the fridge was a wire run through a long tunnel dug centuries before by the Romans connecting the beach to the street on the other side of the hill. Restaurant shack by the sea built from scrounged this n’ that. That’s Mary sitting at the table. After taking a few snaps, Mary and I sat down at one of three tables. Mary ordered a glass of local red and I ordered a beer. While we were enjoying the shade talking to the proprietor, a fellow in a bathing suit rowed ashore in a dink from an ancient day-sailor anchored off the beach. While bathing suit boy spoke good English, the proprietor spoke English about as well as our pigeon Spanish leaning Italian. So we chatted and then a young American girl arrived whose artist mother had a summer home on the island. We all ordered lunch and he served what he had: pasta con sugo di pomodro – pasta with fresh tomato sauce. Along with that came a baguette of crusty Italian bread and a communal bottle of red. When the first bottle of red evaporated, out came another, then another. You get the picture. The bill was 10EU apiece. Can you imagine 10EU for an experience like that? It was one of those memories fly-in yokels with all the plastic in the world can’t replicate. Boating opened the door. 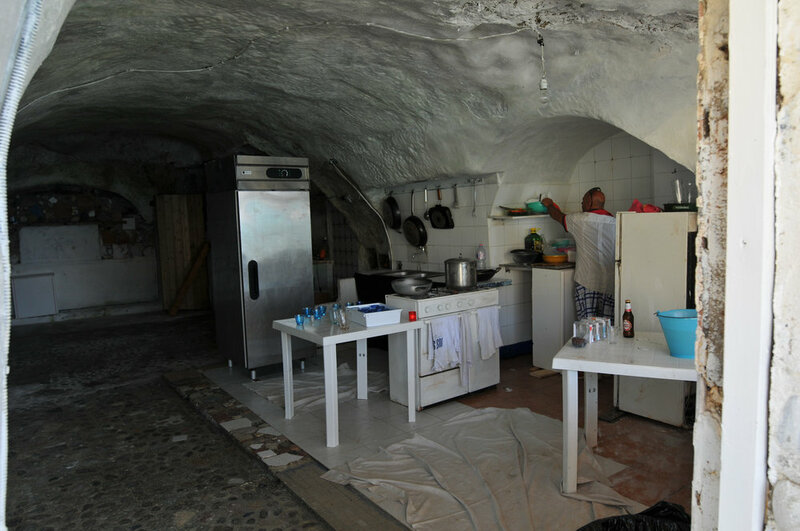 Cave kitchen that works. Note the tile. No slack here. It was a one-item menu with crusty bread, cold beer and red wine. What more could you want? The Egret crew having lunch at the ramshackle restaurant. From left to right: Bathing suit boy, proprietor, American girl who’s mother has a summer cottage on the island and of course, my sweetie. One intangible we miss so much from world cruising is the mixed language conversations we have been privy to. At times we had perhaps 25 people speaking a variety of languages sitting in Egret’s flybridge or boat deck. We didn’t necessarily understand the words but we sorta knew what they said. These days we occasionally watch a U Tube boating video narrated in English as a second language. We miss those conversations. The memories didn’t end with lunch. During conversation day-sailor bathing suit dude said his wife and daughter were arriving later that afternoon on the ferry from Rome. Early the next morning we ran Egret around the southern tip of the island and anchored off the beach near bathing suit boy. Over went the dink and Mary idled over and invited the family for breakfast while I made a second pot of coffee. They were thrilled. So Mary fixed what we call a big boy breakfast with everything. They were a really nice, down to earth family. They own a restaurant within sight of the Coliseum and his wife works in a bank. He said he grew up a short distance away from the Coliseum and said if we came to Rome he would show us the “real Rome.” How cool was that? Bathing suit boy with his wife and daughter ashore at the restaurant after breakfast aboard Egret. The family couldn’t have nicer or more appreciative. Egret left the next morning after the family sailed away and re-anchored in the Inferno. The next adventure was pretty memorable as well. Both sides of the island are riddled with water level caves. We had been in a few before but this time we decided to explore every cave around the island, circumnavigating in a clockwise direction. It was calm so the fist stop was to re-explore the Baths with flashlights. Around the bottom in the dink, past the pinnacles, the windows in the cliffs, the semi circular beach with the restaurant, on to the first cave. Many of the caves had chimneys to let in light. Clear Med water reflected the prettiest blues and purples you can imagine. Some caves were deep, others went just 50 feet or so and one was quite deep, low to no light and ended around a bend with a high basilica type dome. It was blacker n’ black, there was zero motion, zero sound and zero light. The darkness absorbed the beam from the flashlight except for very close by. It was sorta weird. We went back out by braille and were blinded when we reached sunlight. One of three small boat routes thru the pinnacles at the south end of the island. One route may have fit Egret through but we gave it a pass. Better safe than sorry. All in all there are about 15 caves and we explored every one including small ones we had to turn the dink on its side to get past rocks at the opening. Before we reached the north end of the island we began to sweat fuel. We had a partial spare 6-liter jerry jug but that was it. A 3hp Yamadog has an internal gas tank and doesn’t burn much fuel but still... Anyhow, it was what it was and in time we rounded the northern tip of the island and headed back south toward the anchorage exploring a few more caves. This was July and it was hot with long summer days so getting back in daylight wasn’t an issue, just the &%$# fuel. Mary and I stopped for a late picnic lunch on a deserted beach. We sat in the shade of a cliff for lunch then my sweetie (MS) decided to take a snooze laying on the dink while I napped in the shade. While Mary was snoozing, I took one of my favorite all time photographs in the Mediterranean. One of my favorite Mediterranean photographs. Mary is snoozing on the dink after a lunch stop on the return to Egret. The entire island is a contrast in colors from the multi-colored pastel homes to the varied rock formations. Ubiquitous to all was the clear blue water of the Med. And so it went. We emptied the jerry jug fuel into the little engine and made the decision to cut across two bays in a direct shot toward Egret to save fuel. The afternoon sea breeze was puffing so if we ran out of fuel it would be a long row against the wind which wouldn’t have been much fun. In the end we made it and all was well. Another late afternoon we walked high up the hill to our favorite restaurant for dinner and watch the sunset. Unlike most Europeans, we Americans tend to eat early. Mary and I were the first to arrive so we took an outside table with a view past the harbor to the Inferno. We both ordered local swordfish* that are harpooned on the surface in the Straits of Messina, the gap between mainland Italy and Sicily. 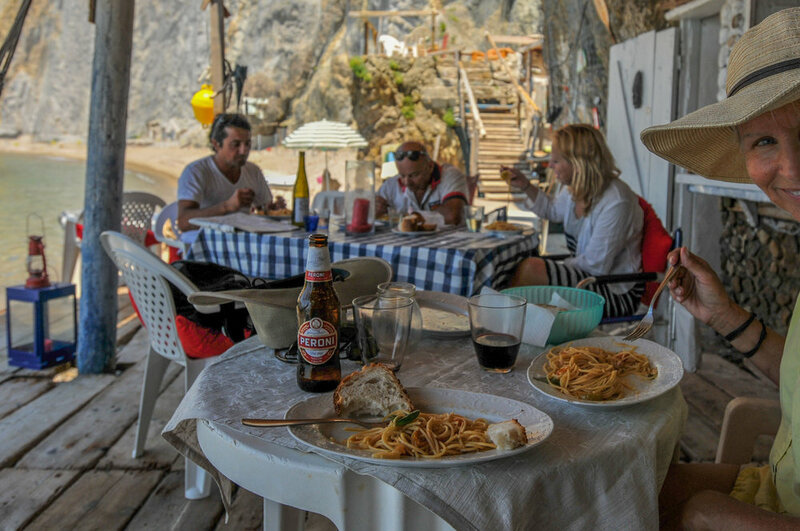 The small restaurant is a family affair like many we enjoyed in Italy. Momma cooks, the kids wait and Poppa drinks beer. Once we were served they put two tables together and they had their dinner not far us. They talked, laughed and carried on totally oblivious to the two foreigners close by. It was wonderful. Everything was totally spontaneous unlike predictable Stateside dining. After a while the tables slowly filled and the family went to work. Except for poppa, of course, who occasionally made the rounds chatting with customers. It was another good evening. We had a lot of good evenings. Colorful fishing boats along the fishing boat quay. Our favorite coffee stop was outdoors below the lattice arches in the upper right of the photograph. It is located on the elevated walkway around the harbor. Small shops line the opposite side. *Swordfish are nocturnal feeders that feed in very deep water currents between the two Italian land masses. Swordfish ‘sleep’ on the surface during the day to elevate their core body temperature after a cold night in the deep. Specialized local harpoon boats with bowsprits longer than the hull itself target swordfish resting on the surface. The larger boat’s hulls are in the 50’ range that are made of wood to reduce noise. All the harpoon boats have very tall masts with a crow’s nest that hold one to three spotters. Rigging sweeping down from the mast in a spider web of wire supports the bowsprit as well as the mast. A single harpoonist stands forward with an array of harpoons depending on the size and type of catch. Weekends liven up the anchorage. Fast ferry leaving Ponza’s harbor. In this case it is a hydrofoil. These things really cook once they are up on their foils. From a distance all you can see is a ball of spray and smoke from the engines. Beginning early Friday afternoon, if you look north toward Rome there are balls of spray in the distance that grow bigger as time goes by. Italians like their flash and their speed and many have plenty of both. The flash boats are what we called in the business, Italian shoes. 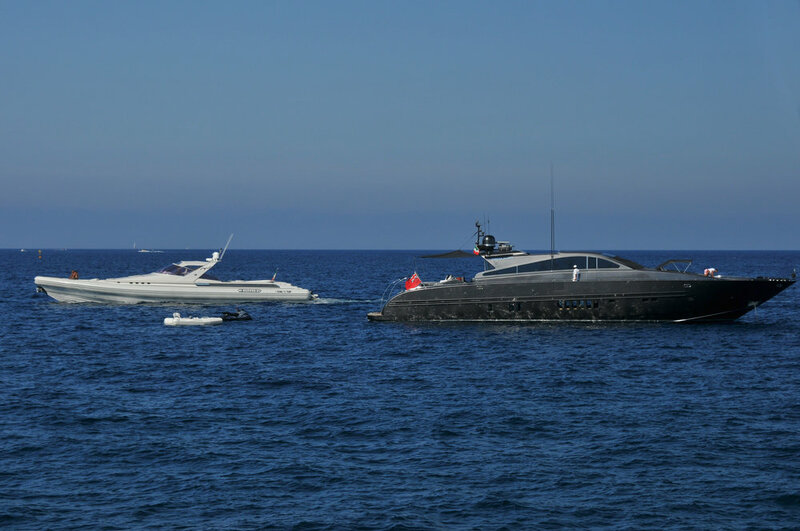 These are low profile racy-looking boats from 50’ and up powered with giant diesels and surface drives. Surface drives run with their props half out of the water, thus all the spray. Typically they idle through the anchorage, supposedly to look for a place to anchor, but, in fact, to strut their stuff. They are all the same. It’s showtime, baby! Heaven 80 cruising by the 107’ shoe with two SYTs on the bow. Its all about showtime and great fun to watch the dynamics. In a side story worth mentioning, Italian shoes are built light for speed. It’s all about horsepower to weight. Another part of the equation is with less underwater drag, the faster the boat. So the shoe bottoms have a very shallow draft. Bottom line: when all the weight is above the waterline with very little below, it is rock and roll city on anchor. Now many of these boats come with sweet young things (SYTs) perched on the forward bow cushion for all the world to admire (perhaps notice would be a kinder word). Now if landlubber SYTs are rocking and rolling, it doesn’t take long before they aren’t happy and if SYTs aren’t happy, particularly if they hurl, there goes the weekend for Viagraboyz. Heaven 80 inflatable, Beach B, approaching the Baths. After making the rounds through the anchorage, it anchored near Egret. Exercise girl is sitting up forward. Oh my. To continue this thread, Italian boat builder XYZ cut an exclusive, multi-year deal with Mitsubishi to provide at-rest gyros to stabilize their boats. So if you didn’t have an XYZ with gyros, where do you think the sweet things migrated? Of course, that left the non-gyro Viagraboyz holding the sack. To get more specific, one Friday afternoon when Mary and I returned to Egret, there was a 107-foot shoe anchored nearby with a pair of SYTs lying on the foredeck cushion in bikini bottoms and sunscreen. So the anchorage was distracted until an 80-foot inflatable made the rounds, "looking for a place to anchor." If Mediterranean way-cool glitz could be distilled into a single scene, this was it. The inflatable had a long foredeck with a companionway door leading below to the accommodations. Behind the living area was a center console with a young captain making the rounds thru the anchorage. Sitting behind the captain in the aft deck seating was a 50ish, good looking dude with a 40 something, very attractive tall thin lady…a lady, not a SYT. She was dressed in a modest two-piece, nothing flashy. After a bit she got up and began a series of stretching exercises. Nothing out of line, however she could put her palms on the deck……not that I was watching. Within minutes she owned the anchorage including the two SYTs close by who realized their stars didn’t shine quite like before. It didn’t take long before the young things re-attached their tops and disappeared below. Later that evening giant inflatable dude and his lady were sitting in the inflatable’s stern seat watching a big screen TV that popped up out of the backrest of the center console. How cool was that? How calm are the morning calms? This simple feather floating by the dingy will give you a clue. During Egret’s three visits to Ponza, spanning a number of years, there was no change in weather. Egret always visited in July, either going to or coming from. Never once did we have to take shelter on the west side of the island. These are a few Ponza memories we shared here. Egret was in Ponza three different times, each for no less than 10 days. So there were lots more Ponza memories. There are many, many anchorages in the Mediterranean, each producing their own memories. Can you imagine? Another view of Ponza’s harbor with the Inferno anchorage in the background. Once you are there, you can’t get enough. It is so beautiful you can’t believe it. This is something you REALLY need to do in your own boat. In the big picture what Egret did isn’t important. She just provides inspiration. What’s much more important is what you do. 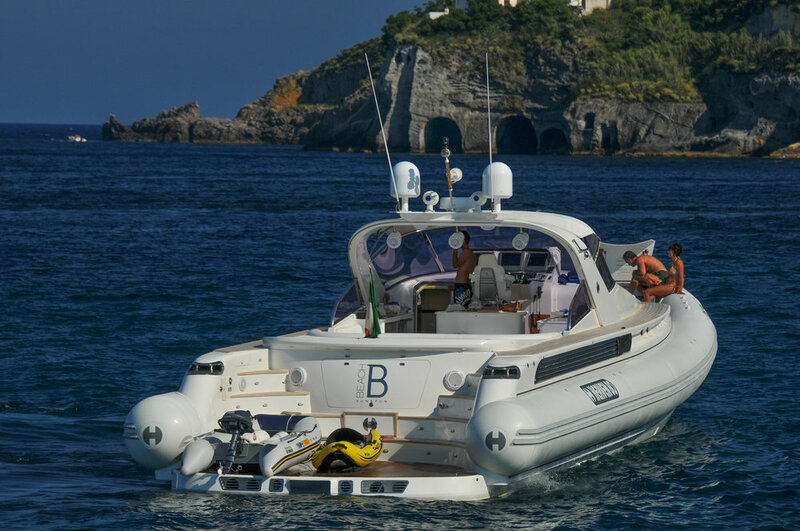 In the next Egret Tales of the Sea posting we will tell you how to visit Ponza and the rest in your own boat.